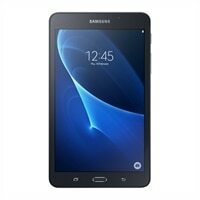 Samsung Galaxy Tab A - 7" 8GB (Wi-Fi) Tablet - BlackThe Samsung Galaxy Tab A 7.0-inch gives you just what you need to do what you love. Browse online, play games or let your kids learn-all on a tablet that's light and comfortable in your hands. And with expandable memory and a long-lasting battery, the Galaxy Tab A 7.0-inch has what it takes to connect you to the things that matter most. The Samsung Galaxy Tab A 7.0-inch gives you just what you need to do what you love. Browse online, play games or let your kids learn-all on a tablet that's light and comfortable in your hands. And with expandable memory and a long-lasting battery, the Galaxy Tab A 7.0-inch has what it takes to connect you to the things that matter most.